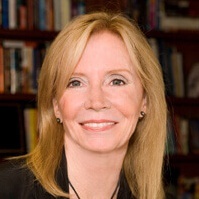 Gail Whiting, ASID, CID – Christmas is such a joyous time of year and with Hanukkah beginning around the same time, it is extra special this year. Our homes sparkle with light and aromas and fill with laughter and love as we celebrate our holidays. 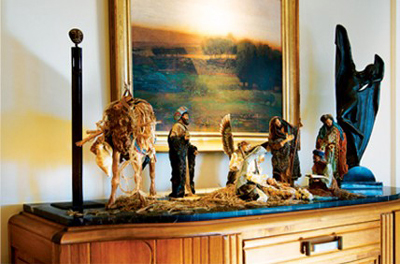 When I decorate my own home it is a collection acquired over time with some new elements added each year. I have only a few very old ornaments from my mother, lots of handmade ones from children and relatives as well as the ones that represent a place I have traveled to. It is quite a mishmash, but colorful and memorable. 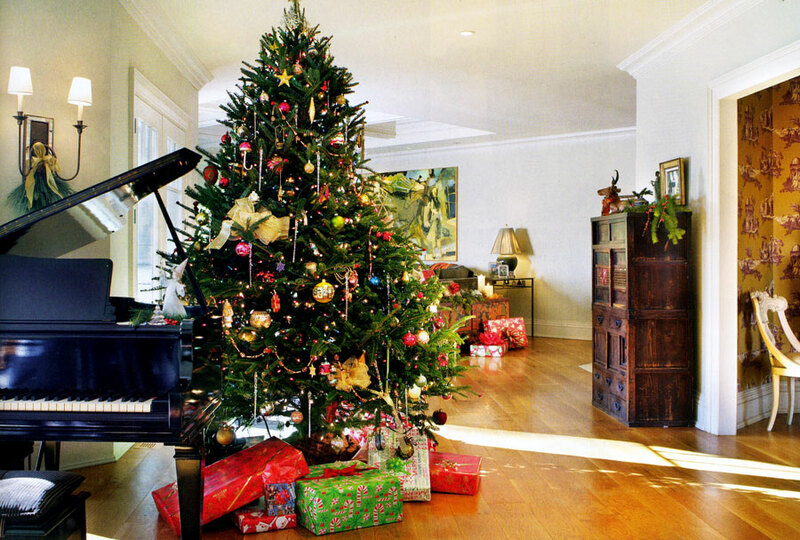 I always have a large tree that goes to the ceiling (much to my husband’s dismay). Sometimes there is a star at the top of the tree, other years there is an angel. 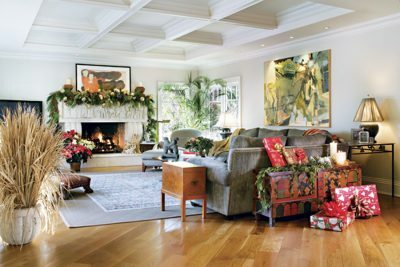 In my home the fireplace, with its’ hand carved limestone frieze, is the focal point of the family room. The mantel is decorated with gold and silver reflective ornaments mixed with metallic ribbon and greenery. I feel mantels should be dramatic, sometimes overdone. 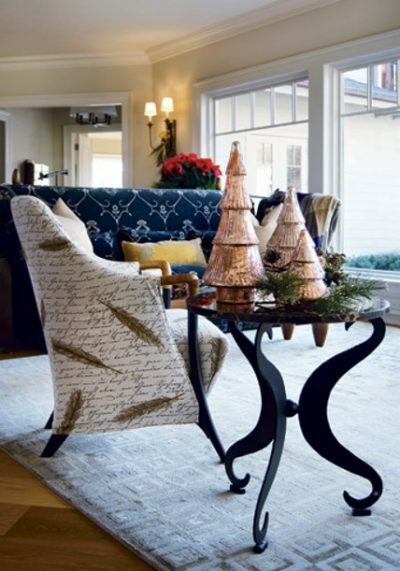 In the living room is a grouping of coppery glass trees sitting on a marble and iron side table. The chair is covered in a feather quill pens and script writing fabric. 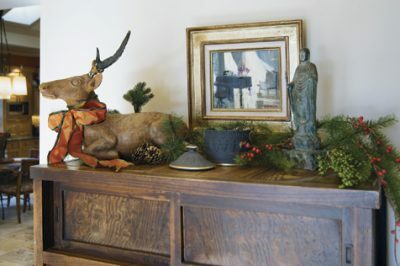 On top of the Japanese kitchen cupboard is an antique hand carved wood deer dressed in a persimmon bow for the holidays. For many years the Nativity scene was under the tree with an old Lionel train. Now it is a beautiful Italian one on top of the art deco cabinet with an angel hanging above. Candles add the perfect lighting for holiday decorating. If you like real candles use beeswax because they won’t produce smoke and will burn for a long time. Battery operated candles have come a long way and are now available in many sizes, flicker, have the dripped wax look, and best of all have built in timers. 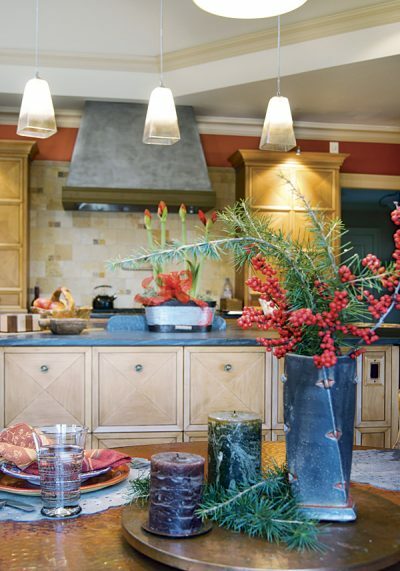 Christmas decorating can be as simple as an angel on your bathroom counter with a sprig of pine or filling a kitchen vase with fresh greens and red berries. 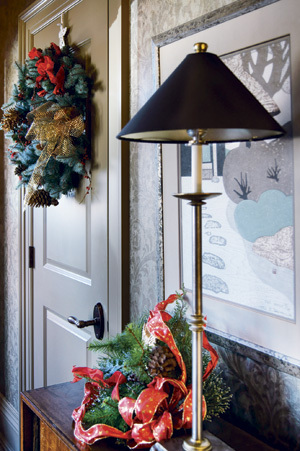 Don’t forget your entry doors, people can feel the joy before they even enter your home. Whether you prefer a match coordinated look or a collective eclectic style, go for it, and decorate your home with flair. Here’s to a prosperous New Year with Joy.